Happy New Year! With another year upon us, why not strive to start 2018 off right with a focus on making this your healthiest year yet? Did you know that regular acupuncture treatments can assist you in this goal?! Most people might associate acupuncture as only helping with pain conditions but it can help with so much more. 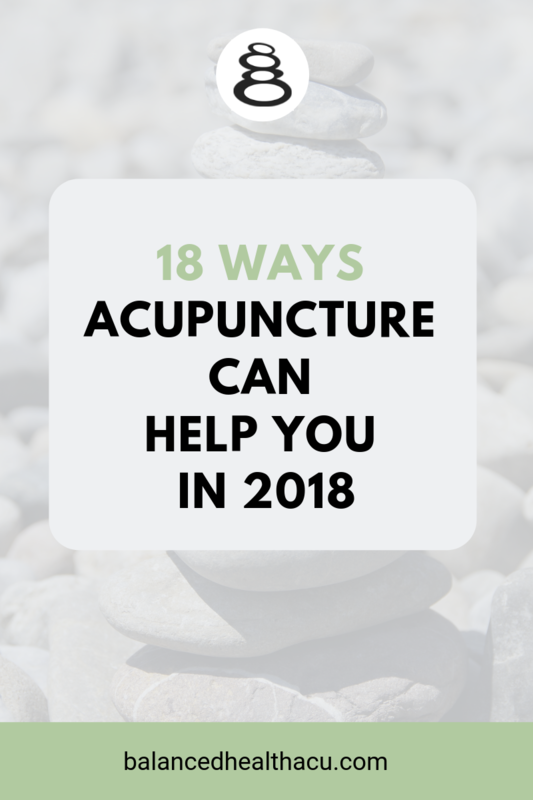 In case you missed my post detailing why you should choose acupuncture for your health and wellness, I’ve put together a list of 18 ways acupuncture can help you in 2018. I know that I could come up with a much longer list but we’ll stick with 18 for now in the spirit of this new year. I personally, however, don’t need a lot of convincing when it comes to ways that I can keep myself and my family healthy. Our physical and mental well being is of utmost priority to me as you only live once, right?! I for one want to make this life a good one- one that I can enjoy because I feel good, don’t get sick and aren’t struggling with chronic conditions. I want the same for my kiddos too. So, what are you doing for your health this year? If you’re not feeling your best or want to make sure you KEEP feeling your best, give acupuncture a try. Not sure if it can help you? Read on to discover how acupuncture may just be the help you are looking for this year. Gas and bloating are two common symptoms a vast majority of people feel on a regular basis due to irregular or poor eating habits, stress, and simply living life on the go. Acupuncture regulates and strengthens the digestive system so that you feel energized after eating, not gas or pain or bloat. Acupuncture sessions also spark the parasympathetic nervous system which helps calm the mind which ultimately eases digestion since we often hold our stress in our abdomen. Anxiety can be a constant companion for some or can simply creep up when life gets busy or when worries pile up. Why not calm anxiety in a manner that works with your body, creating homeostasis at the physical and mental level? That’s one of the amazing things about acupuncture--by simply placing a few needles, we can restore balance to the body that not only affects the physical but our mental health as well. Staying present in the here and now is very fleeting as we worry about the future or mull over the past. The experience of an acupuncture treatment can help you practice mindfulness--learning to stay in the present moment. While you’re on the treatment table, it’s a great opportunity to take note of what your body is feeling: how your jaw muscles relax or your shoulders drop from your ears, or how you hear your stomach start gurgling. You can take this newfound mindfulness into your daily life which will help you to stress less, develop patience and recognize when your body is out of balance and needs another treatment! Don’t just accept that you get 1-2 colds per year or need to suffer through allergies. Acupuncture has the ability to strengthen your immune system to not only attack a cold head on once it occurs but most importantly, to prevent them from occurring. Invest in preventive medicine with acupuncture. We need rest. Period. If you are not getting it, we can work on it. Whether you’re having a hard time falling asleep, waking frequently, or simply not getting enough restorative sleep, acupuncture can help. Acupuncture can literally help you become unstuck, helping you to have more consistent bowel movements. You shouldn’t have to rely on coffee, fiber supplements or laxatives to ensure a bowl movement every day. Not going regularly can also lead to pain, bloating and injury with straining. We can identify the root cause of the problem and address it with acupuncture. It may be intimidating to start meditating but meditation has many proven health benefits such as improved concentration, improved immune and cardiovascular health, and even improved metabolism. Resting during an acupuncture treatment is the perfect opportunity to try meditating. The treatment session gives you an interruption-free moment to practice. Acknowledge thoughts as they arise but then let them go. With each acupuncture session you may just come to love meditation and begin to practice it at home. We have already had our first snow here in Massachusetts but I’m sure we will be putting our shovels to use some more this winter before it’s over. So whether you need relief from a sore back post shoveling or after an intense work out, or from gardening come spring, don’t let injuries linger. Acupuncture can reduce inflammation, relieve pain and ease sore muscles that have been overworked. There’s no doubt that we are all juggling many, many responsibilities in life and often without much rest or opportunities to stop and recharge. You can only run on all cylinders for so long, especially if you’re not getting a lot of sleep at night. Acupuncture treatments offer a much needed rest time, giving your body a chance to stop and focus your energy on healing. We might not be able to stop and take a 40 minute nap during our day, but it’s a given with an acupuncture treatment and I’m sure much needed by most. I see MANY patients who struggle with headaches on a weekly or even daily basis. Some just try and push through but others are forced to bed to recover, missing work and more. It’s time to uncover why you may be experiencing headaches so that you can get some longstanding relief. For some, headaches occur because energy is stuck while for others they may occur because there is a deficiency in the body. Find out what’s at the root of your headaches. Acupuncture can help both causes! I love when a new patient comes out of his/her first acupuncture session and says, “Wow, I feel so relaxed!” It’s almost as if he/she forgets what that can feel like. Your body begins to experience positive changes after each acupuncture treatment. With these changes, I find that people become more in-tuned with their body and more aware of what their body is telling them on a day to day basis. With this renewed body awareness, you can realize quicker when something may feel “off” either triggering a lifestyle change or the need to schedule your next appointment before things progress. Whenever I ask a patient whether they experience PMS I often get the answer “Yes, I have the normal PMS symptoms.” Experiencing cramps, mood swings, headaches or other PMS symptoms does not have to be the norm before a menstrual cycle. Acupuncture can help regulate blood and energy flow so that your menstrual cycles are regular and without accompanying symptoms. Kick PMS to the curb this year with acupuncture. There is no separation of the physical and mental in Traditional Chinese Medicine so by regulating the body’s physical energy you are also impacting the mind and spirit and vice versa. Several acupuncture points can have a profound effect on the mind, even helping to release deeply held emotions. Pericardium 6 is an acupuncture point found on the inner wrist that can release emotions in a treatment. A patient might say that they found themselves crying tears during a treatment and weren’t sure why but that they felt so much lighter after the treatment when this point was needled. We live on our phones, tablets and computers and our neck and shoulders often pay the price as well as our forearms, wrists and fingers. Give them a much needed break with an acupuncture treatment which can reduce the inflammation caused by repetitive strain and improve blood flow to these overworked areas to hasten recovery and prevent further injury. What have you done for yourself lately? If it’s taken you more than two seconds to think of an answer then we need to rectify that. Acupuncture treatments can give you that much needed me time to decompress and recharge. Treatments can offer me time that is guilt free because while you are resting and taking a much needed breather, you are also healing your body. It’s a two-for-one opportunity (or more if you really count up all the benefits you receive from one treatment!). Do you have a health issue that’s been plaguing you for some time? Unsure what to do about it or thought that you’ve tried everything? Why not give acupuncture a try? Resolve to no longer accept a chronic condition as your norm in 2018. Acupuncture has shown in research studies to trigger the nervous system, essentially stopping the chronic pain loop. It can also reduce chronic inflammation which is at the core of so many health issues today such as digestive disorders, pain syndromes, and auto immune conditions. There is no need to drag anymore. Life is too short. Acupuncture can fortify your adrenals, giving you a much needed energy boost that you may be lacking. Quick fixes like caffeine won’t give you lasting relief, but acupuncture works from the inside out to make sure your body is functioning properly so that you can create the energy you need for your daily life. Give your adrenals some love this year and schedule a much needed acupuncture treatment. You really don’t need any other reason to convince you that acupuncture is a great option for you beyond that it can help you feel better and healthier. We are only given one life so shouldn’t we live it to the best of our abilities? That includes living a life in which we don’t have to struggle with any chronic illness or pain or where we feel anything less than our best selves. So go on, try some acupuncture. You’ll soon be adding to this list of reasons why you should get and why you LOVE acupuncture. What reasons can you add to this list as to how acupuncture can help in 2018? Share below in the comments!